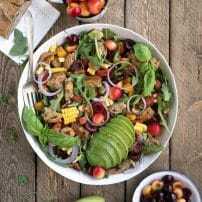 Made with garden-fresh tomatoes, spicy red onions, delicious sweet basil, and an easy three ingredient balsamic dressing, this Tomato Basil Salad takes just 10 minutes to prepare start to finish. 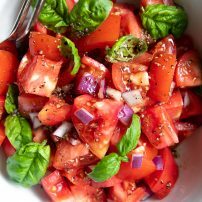 Enjoy this gluten-free, dairy-free, and low-carb Tomato Basil Salad as a light lunch or delicious side to all your favorite main courses. A tomato salad can either be really good or really…bad. 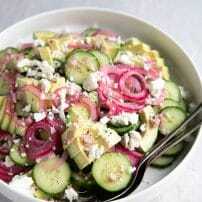 This is one of my favorite salads ever. 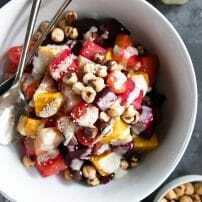 Simple ingredient list and short prep time, I can enjoy it for lunch, or quickly toss it together and serve a big bowl with chicken or fish and some fresh bread for what I like to call the easiest and most balanced dinner (probably) ever. Ok, let’s make the best tomato basil salad ever. The best tomatoes for this salad are garden-fresh tomatoes. Hands down, no way around it, if you can get your hands on garden fresh tomatoes, just do it. But, I’m a realist -at least when it comes to food- and fully understand the struggle of growing your own tomatoes. My husband tried this year (again) and I’m pretty sure we got 2 miniature tomatoes. Remember that, no matter the situation, late-spring, summer, and early-fall will always yield the best-tasting tomatoes. This may vary depending on where you live and where you shop for fruits and vegetables (grocery-store versus farmer’s market). If it is winter and you need tomato basil salad (like yesterday), Heirloom tomatoes are your best bet. Many markets will still carry Heirloom tomatoes even in the dead of winter. But! (and this is a big BUT) just because it’s an Heirloom tomato, does not guarantee it will taste good. Check the tomatoes firmness- you want a tomato that is ripe, yet still firm. If there are soft spots or pockets, it will end up mushy and chalky. Maybe you like that? I do not. Smell them. Do they smell good? If they smell like a delicious tomato, this is very good. Plan ahead. Are you going to make your salad right away? Or in a couple of days? 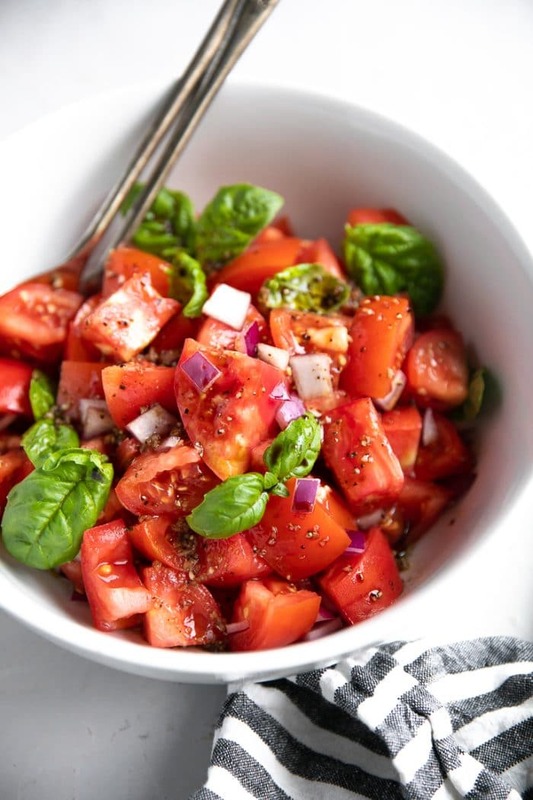 If you do not plan to make your tomato basil salad immediately, purchase tomatoes that are slightly firmer. What about all the other types of tomatoes? This is actually a really great question since obviously there is more than just one type of tomato out there. Beefsteak– these are the big, fat, juicy tomatoes that are often used on sandwiches, or, yes, salads! You will want to pick your beefsteak tomatoes just like you would Heirloom tomatoes. Plum (Roma)– Not recommended for salads, but highly recommended for homemade sauces and soups, these tomatoes have thin skins and lower overall water content. Cherry– I may be somewhat biased since I have a small addiction to these tiny tomatoes and eat them like candy. Small, sweet, and perfect for salads, if you get a batch of good cherry tomatoes then these would most definitely be the next best pick for this tomato basil salad. Unfortunately, unless you can sample what you are buying, they’re harder to judge. Add the balsamic dressing just before serving. If you are using Heirloom or Beefsteak tomatoes, chop them into large(ish) chunks rather than itty-bitty pieces to prevent the salad from feeling more like salsa or relish. Make it your own. Feel like adding cheese? Go for it! Mozzarella pearls or grated parmesan would be a great addition. Easily make it a complete meal with some chickpeas and chopped avocado. Good quality EVOO (extra virgin olive oil) is highly recommended. Is this tomato basil salad still good leftover? I should answer this question first. The honest answer is that it will probably depend on who you ask and whether or not your tomatoes were overly ripe. If you ask me or my husband, we would happily enjoy this salad leftover the next day. In this case, I tend to enjoy it more when it’s mixed with some kind of other food and not as a stand-alone salad. I may add some pasta noodles or rice, chicken or beans, or, literally eat it with whatever I’m serving for dinner that night. With that said, I highly recommend enjoying within 48 hours. Of course, it will last longer, but the freshness will not be there. How to store this tomato basil salad? The best way to store any leftovers is in a tightly sealed container in the refrigerator. 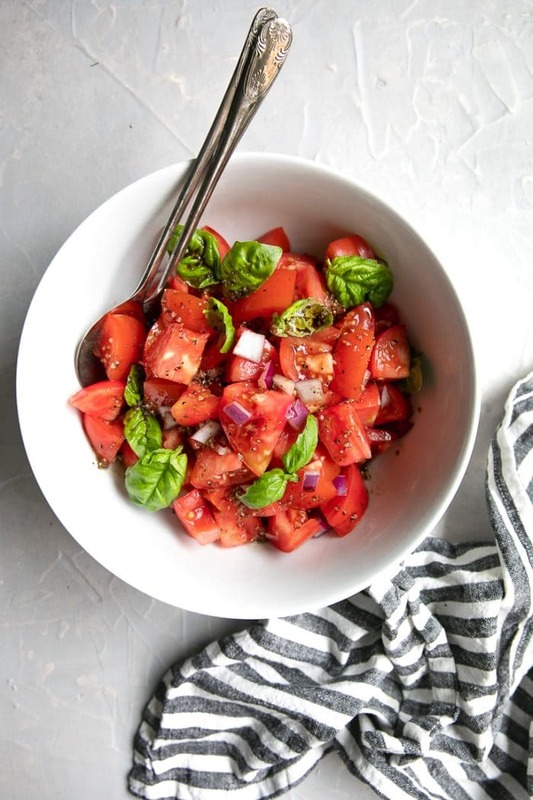 If you try making this Tomato Basil Salad, please leave me a comment and let me know! I always love to hear your thoughts. DON’T FORGET TO PIN AND SHARE THIS EASY BALSAMIC TOMATO BASIL SALAD RECIPE AND SERVE IT WITH ALL YOUR FAVORITE CHICKEN, STEAK, AND FISH RECIPES! 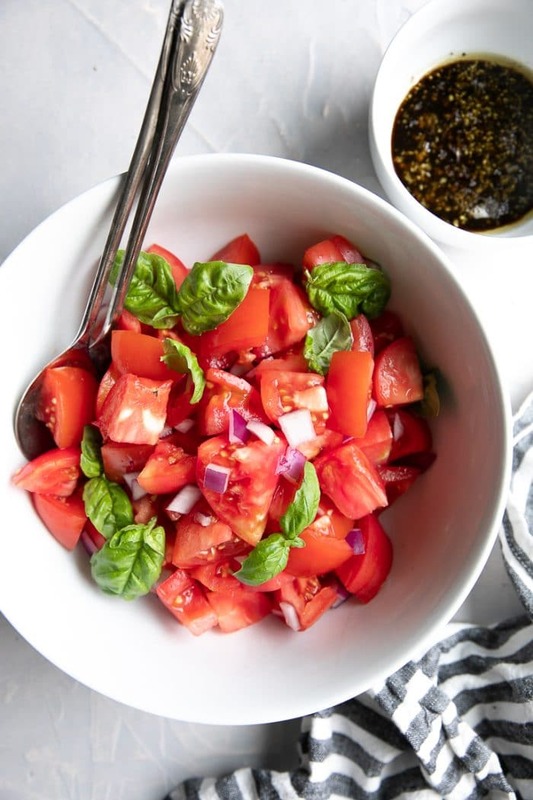 Made with garden-fresh tomatoes, spicy red onions, delicious sweet basil, and an easy three ingredient balsamic dressing, this Tomato Basil Salad takes just 10 minutes to prepare start to finish. 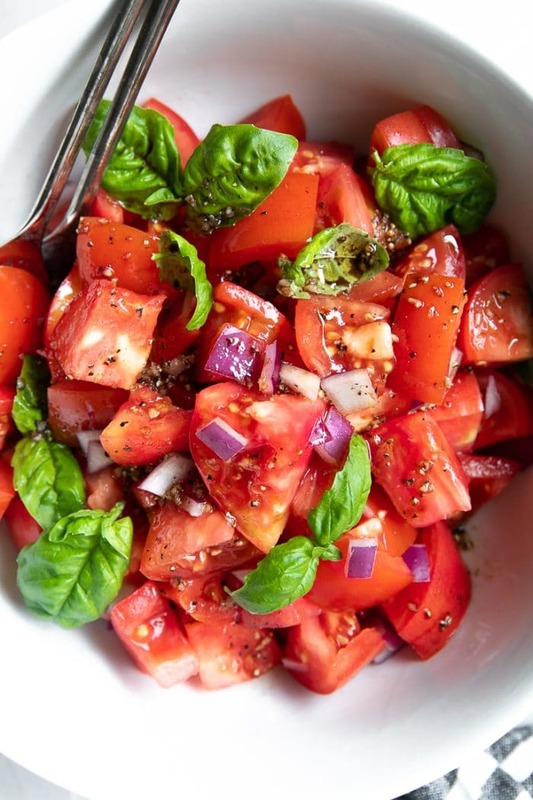 Add the tomatoes, onion, and fresh basil to a large salad bowl. Gently mix to combine. In a separate bowl whisk together the olive oil, balsamic vinaigrette, garlic, salt, and pepper. Combine the tomatoes with the vinaigrette. Allow salad to rest for 5-10 minutes at room temperature to allow flavors to marinate together. Enjoy! Thank you for the terrific salad!